My physician recommended physical therapy but I'm not sure what a physical therapist does. Physical therapists are experts in the treatment and management of conditions that impair one's ability to function. Therapists use treatment techniques to improve movement, reduce pain, restore function and prevent disability. Physical therapists have earned their bachelors degree in a health related field, completed a graduate physical therapy program and have passed a national licensure exam. 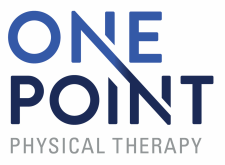 The physical therapists at OnePoint Physical Therapy completed their Doctor of Physical Therapy (DPT) degrees in addition to becoming board certified in their respective fields. Do I have a choice in providers? Yes you do have a choice! A physical therapy referral is not specific to the clinic is written on the prescription. It is your choice where to receive treatment. It is important for you to seek the right clinic for the right care. Come see how we are different. If we can't meet your needs, we can help you find someone that can. New patient evaluations typically last about an hour. It is recommended you arrive about 15 minutes prior to your appointment with your paperwork already filled out. It is also recommended you wear comfortable, athletic clothing to facilitate a thorough evaluation. Your evaluation will include a discussion about your past medical history and current issues, specialized testing for your condition and a discussion regarding our findings, your personalized plan of care and your treatment goals. Can I come see you without seeing my doctor first? State law in Georgia gives patients direct access to physical therapy services for 8 visits or 21 days without a referral. This does not obligate your insurance company to pay for your visits and the law EXCLUDES dry needling as a service. We do provide a discount for cash pay patients and do provide pain management solutions outside of needling for direct access patients. Not sure if we provide a service that would benefit you? Call us or stop by, we can help. You aren't in network with my insurance company, can I still receive treatment at OnePoint? ​Yes. Some insurance companies and plans provide out of network benefits. We can help determine your eligibility and work to meet your needs. We do offer a self-pay discount and we urge you to compare costs with other providers. Just because you are in-network doesn't mean you are getting the best value! Frequency and duration recommendations will be made at your evaluation and are dependent on a number of factors including your condition and goals. We strive to provide a meaningful change in your symptoms within 4 visits. Your health is our priority and we will help you find the appropriate treatment if physical therapy isn't helping. I have chronic back or neck pain. Can physical therapy help me? Physical Therapists have advanced training in the prevention, treatment and management of conditions that cause pain and impair function. We are well equipped to help you manage and improve your chronic pain, even if other treatment strategies have failed. We believe you will find value in our care. Your clinic is in a neighborhood. Where can I park? ​We are conveniently located in the heart of Virginia Highland at the corner of Greenwood Ave and Barnett St. Street parking is free and readily available and our clinic is wheelchair accessible. We are confident you will find parking here more convenient than most medical offices.